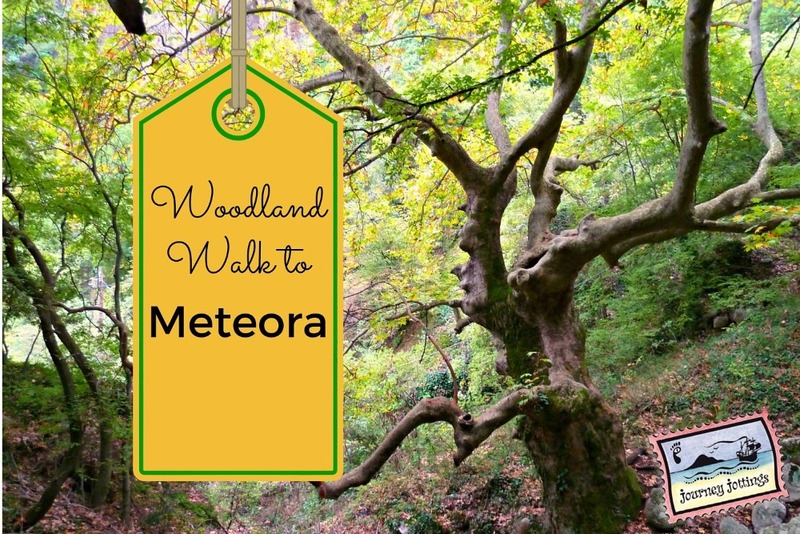 For several hours we’d been winding our way up through ancient woodland when we broached the top of a hill and the largest and oldest of Meteora’s monasteries – The Great Meteoron – came into view. Perched on the top of its sandstone pillar it appeared to float in the sky against a backdrop of snow capped mountains. …to be captivated by both the magical landscape and the mystical stories of the monasteries’ creation 700 years ago, when monks hauled building materials up via pulley net systems to build these remarkable religious refuges on top of and in the sides of these unique landforms. While you can of course drive the circuit that circumnavigates the 6 remaining monasteries that are open to the public (there were 24 originally built in the region), I liked the feeling of making my first approach on foot, giving myself the opportunity to immerse myself in the landscape and experience a sense of connection with those who had walked this way before – a mini pilgrimage of sorts! The sandstone pillars form a labyrinth of paths in between their bases, so I joined a comfortable 8km walking/hiking tour run by the local Visit Meteora office, whose guide led us through the beautiful wooded landscape along a maze of zigzagging paths otherwise only used by shepherds and their dogs. A bus picked us up before 9 taking us out to the other side of the neighbouring village of Kastraki, where we were dropped off beneath a canopy of trees showing their first signs of autumn. We had barely begun when Lazarus pointed up to a cave in the dome shaped rock above us where the remains of a hermit’s dwelling could be seen – While telling us a fabled tale of its early day occupant (left photo above) I squirmed at the thought of the rock climbing skills required to gain access! 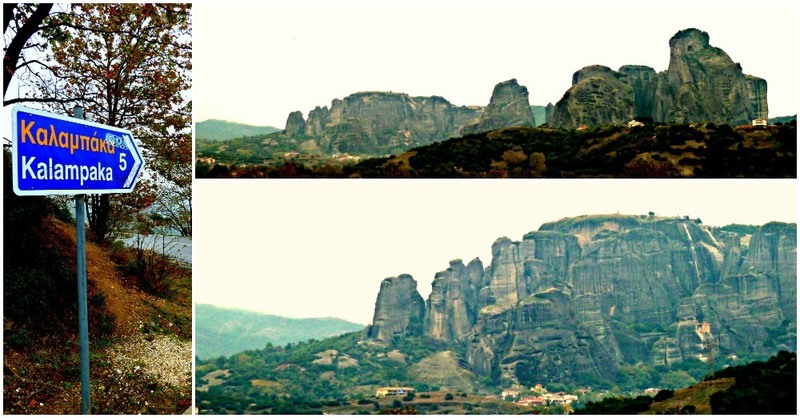 Rounding a few more bends, our path wound around and below another hermit cave, this time ‘boarded’ up with sticks and logs (centre photo), before being lead between Meteora’s characteristic tall steep sided sandstone pillars. 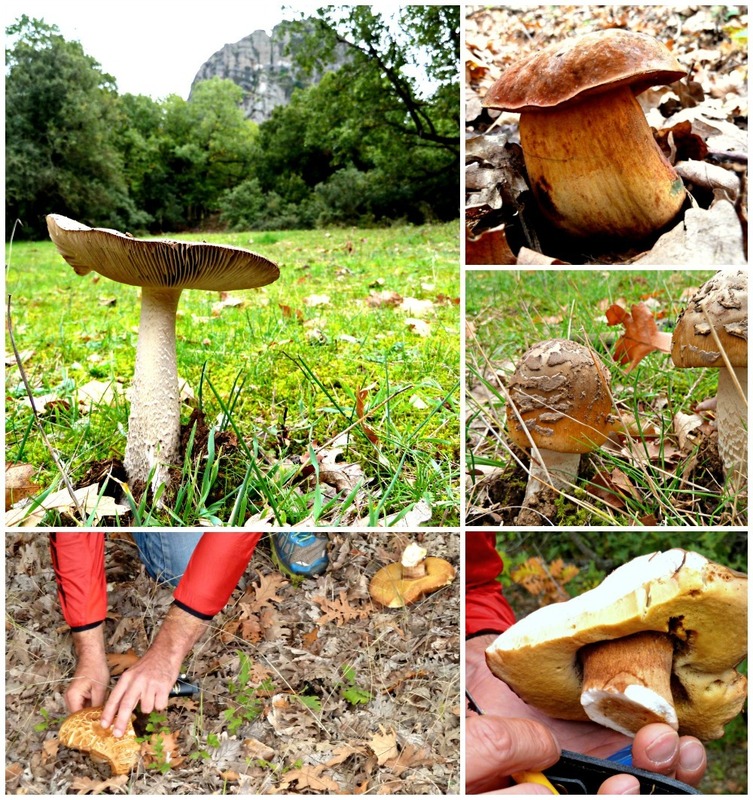 The ground was bursting with toadstools and edible mushrooms, which our guide promptly picked for dinner. One of the greatest joys of approaching the more well known monasteries on foot is the hidden gems you find along the way that are only viewable by taking this less travelled walking track – ie they’re tucked away off the main tourist route. Looking up the sheer cliff face we could see the struts supporting the hermitage’s overhang out from the ledge it was perched on (top left photo below). The path then meandered up and around to reach a plateau, which gave us a wonderful eye-level view directly across the chasm below to the hermitage on the opposite cliff face. 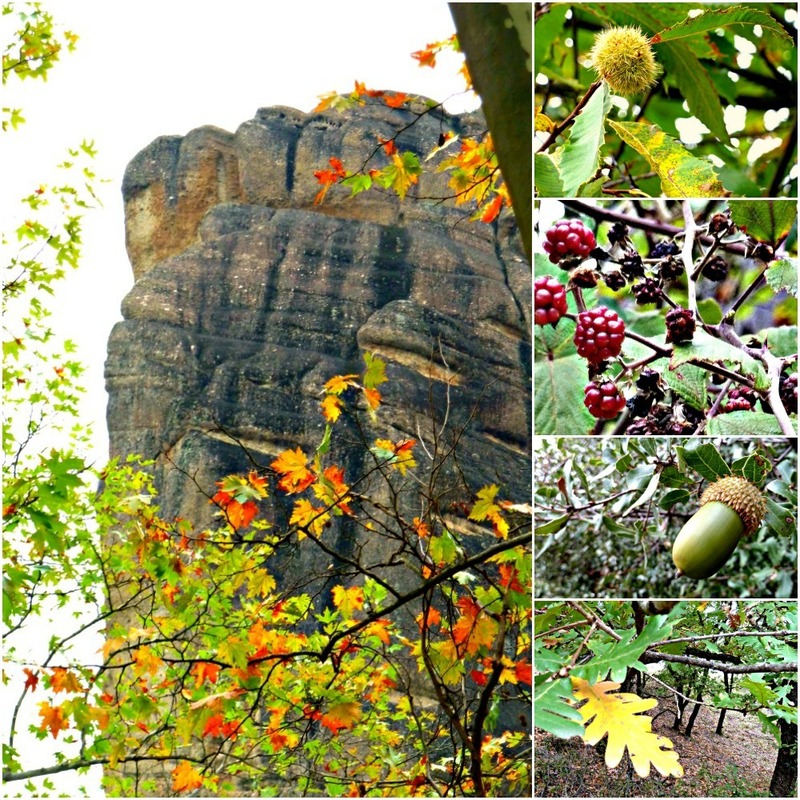 …that contrasted with the soft leafy woodland, which was a biophilac’s delight! 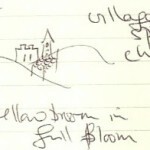 …with splashes of pink cyclamen and lilac crocuses – the source of saffron – popping out from the leafy forest floor. When the final ascent brought us out over the top brow of a hill to reveal below the largest and oldest monastery in the region – The Great Meteron – I felt quietly awe struck. Inside was a glimpse into the monks’ sacred world. 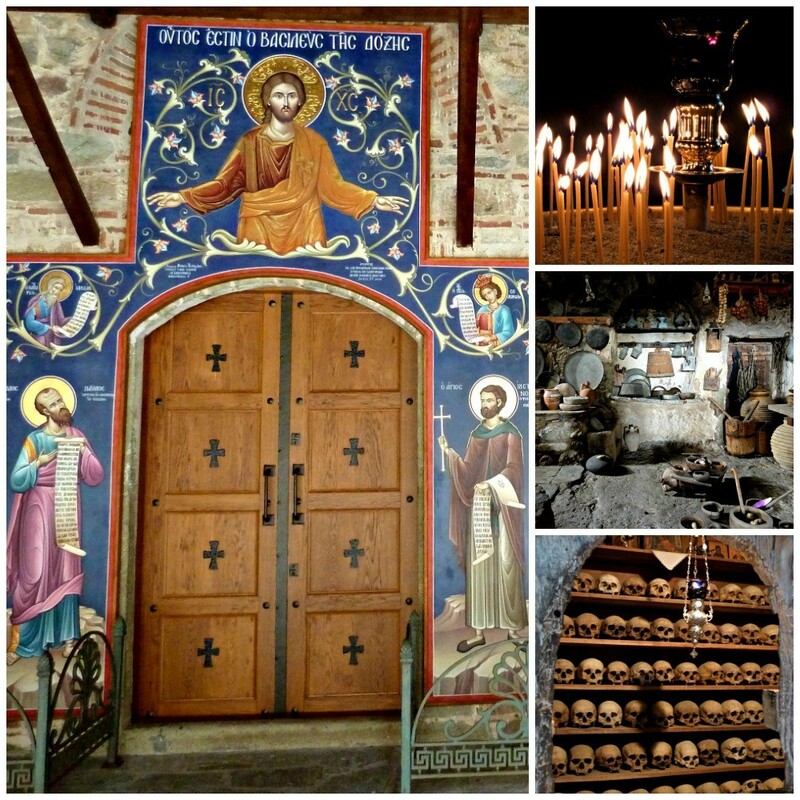 The simple fundamentals required to nourish the body with the original ancient kitchen left as it must have been for 100’s of years prior for providing sustenance to the religious occupants; there was exquisite ornate decoration expected in a place of contemplation and worship, candles, and a remarkable room of homage to the monastery’s forebears – a room of skulls. 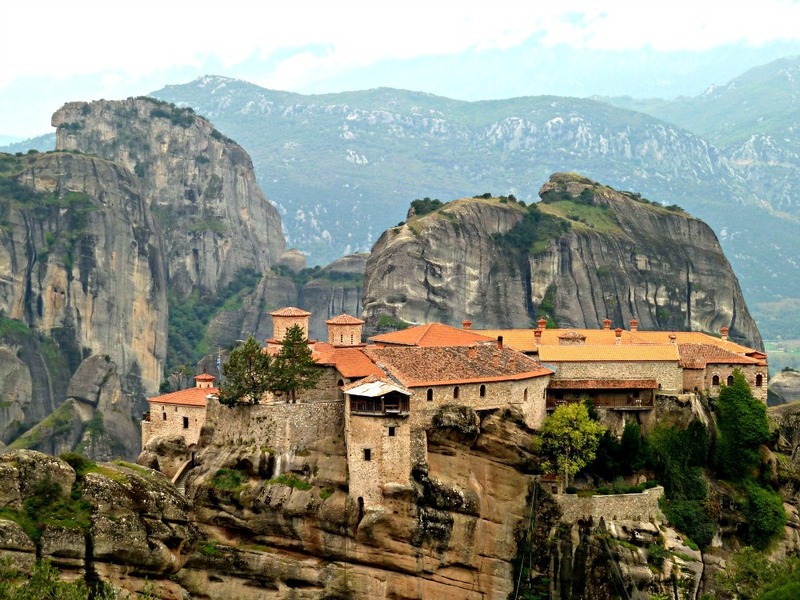 Meteora is situated in northern central Greece – about 360 km (225 miles) north west of Athens. where even the chimney pots atop of the houses in the main street are in the shape of a monastery. Meteora is an UNESCO site that is listed under 5 of a possible 6 Cultural Criteria, the first of which is that it “represents a masterpiece of human creative genius and cultural significance”. 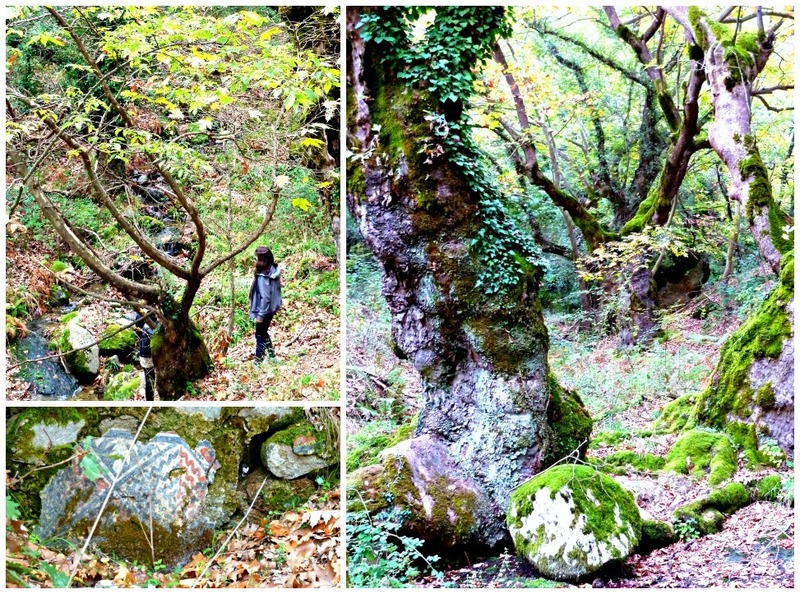 We were out for 4 or 5 hours, which included time in the Great Meteoron Monastery (3 Euro entry), followed by a gentle walk back down along a stone paved path through the woods to be picked up by the bus, beneath the adjacent Varlaam Monastery. 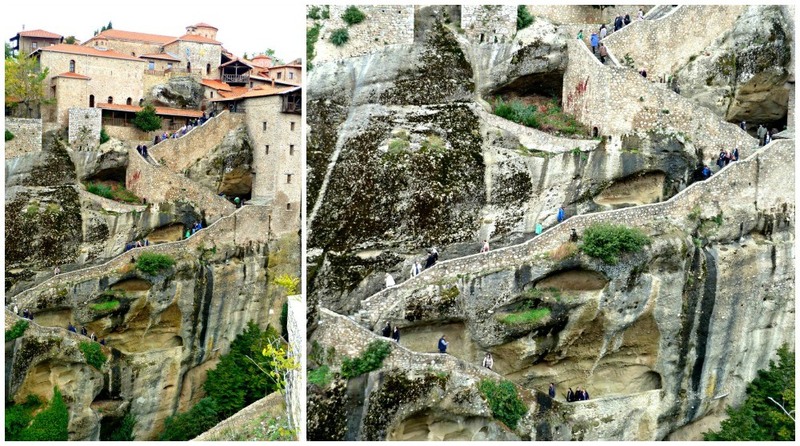 Have you seen photos of Meteora and been entranced? Or more exciting – have you already been? 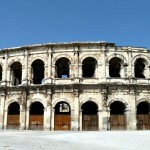 Have you Been Disappointed by a Travel Destination? 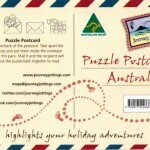 This entry was posted in Postcards from Europe and tagged greece, story map by Linda. Bookmark the permalink. 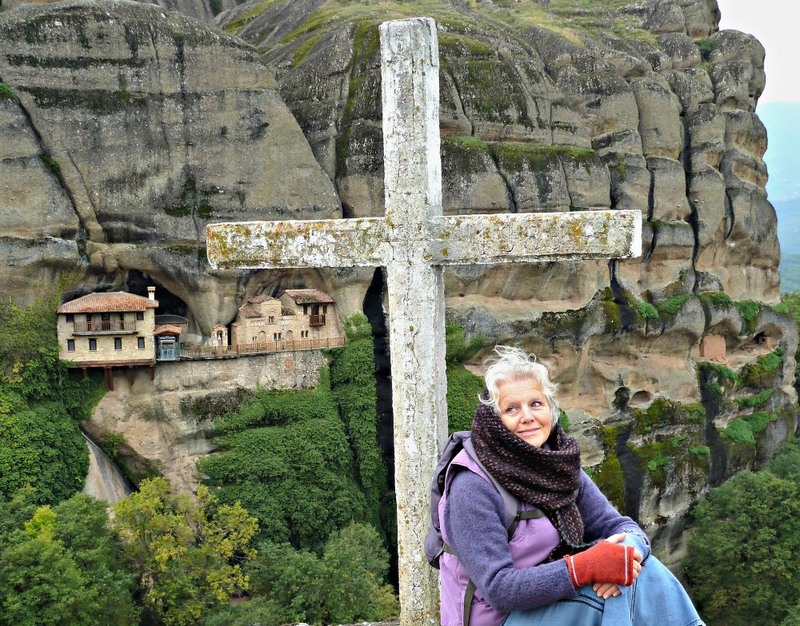 I was lucky enough to visit Meteora as a kid (aged 9) and still remember it, but not well enough I don’t think – I have to go again! I love the sound of the initial walk you did. What an amazing place. I’d love to do the walk. 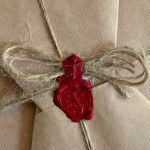 Your post today had all the elements of a quest wrapped into a fable. It should be part of a book 🙂 I loved the photo of you at the Monastery of Ypapanti – you looked beautiful and the perspective was incredible. Clinging precariously to cliff faces and sitting atop sandstone pillars these monasteries do feel quite fairy tale like (thinking of Rapunzel here) and as you say – seeking it out on foot – did have the essence of a quest! I totally agree with you Jo. It is an amazing place indeed. Everything looks beautiful. It’s amazing the way these monasteries are built into the cliffs. I think your choice to discover the Mereora monasteries on foot was a good one. It certainly looks a bit like a fairy tale in the photos. What an incredible spot to explore on foot, so beautiful. 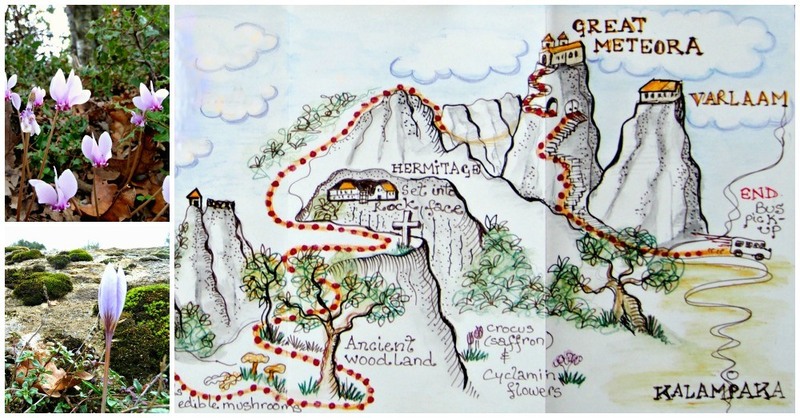 You are very talented with your drawing, I adore your hand drawn maps and sketches. Wow, amazing feats of building! 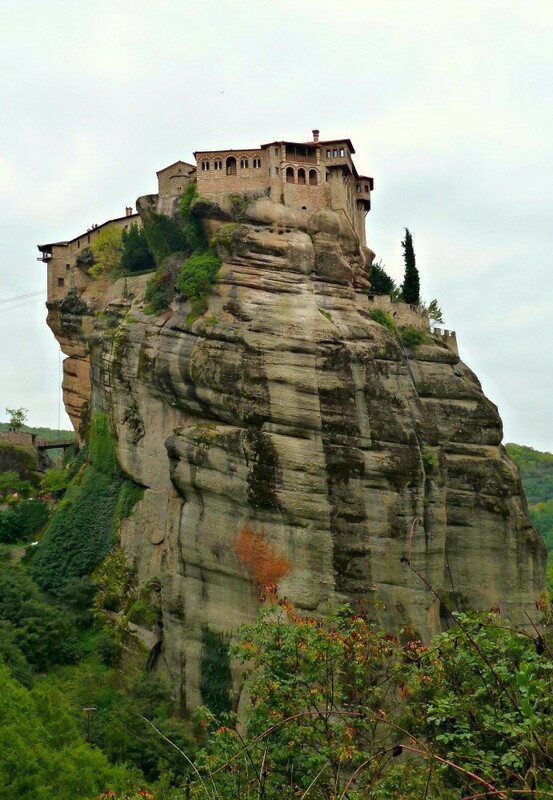 We were not familiar with Meteora or these monasteries so this was a real eye opener. Absolutely fantastic. The GypsyNesters recently posted..The Ultimate Baby Boomer & Empty Nester Gift Guide! 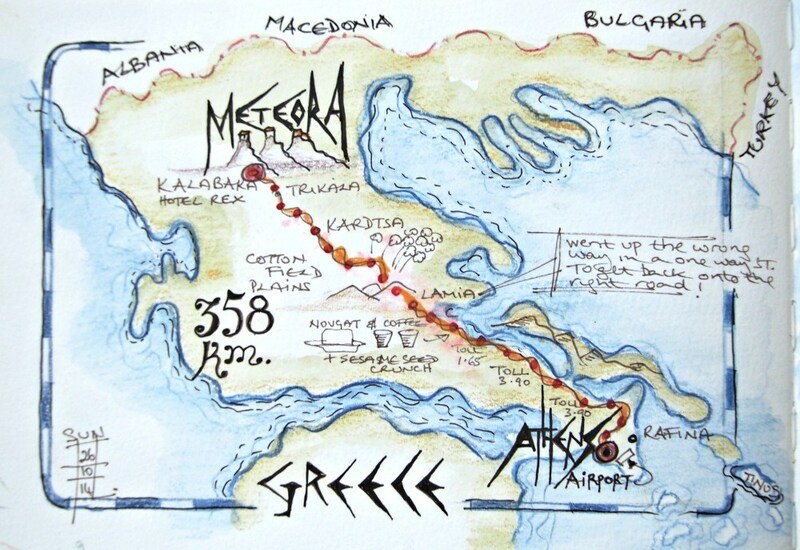 I’m very envious – I’ve never managed to get to Meteora but the more I read about it the more I want to go. 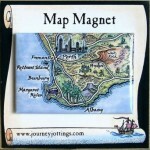 And I love the idea of your guide picking locally growing mushrooms for dinner! 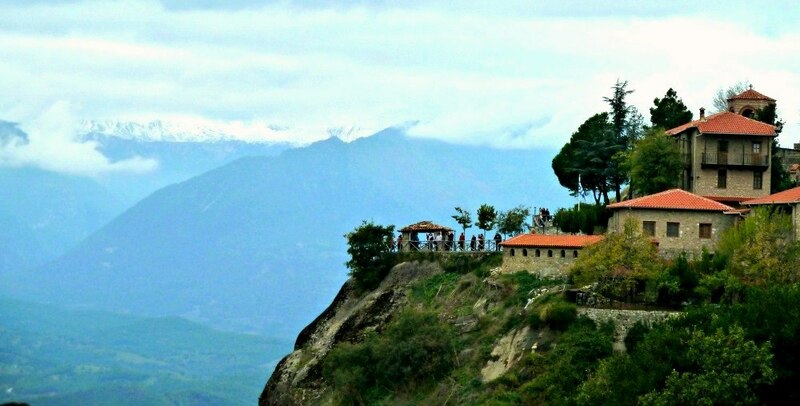 The combination of mystical monasteries and such a magical landscape are a winner! 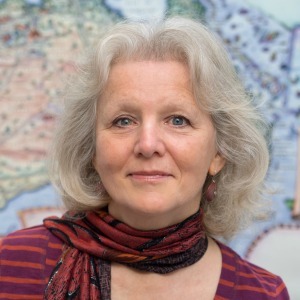 What I love about your blog Linda is apart from the great and fun drawing, the amazing view that you always never fail to share. I enjoyed reading. Thanks! 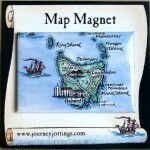 So happy you enjoy reading my perspective on places I’ve travelled to… along with looking at my story-maps! 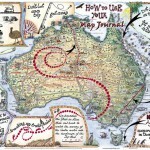 Your story maps really tells many details of your travel. Makes every read of your blog something to look forward too. 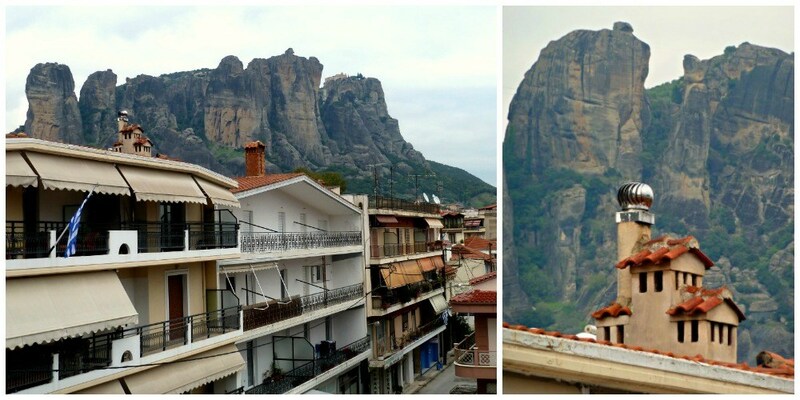 I visited the Meteora site a few years ago, we caught the local bus up and walked back down! I must say your woodland walk up sounds tremendous, even though I was thrilled by our venture downhill! I overcame some vertigo to cross those bridges to the moan asterisk! Love your pictures and photos , brings back lots of good memories of the treasures within these monasteries and the outlook from them! Your way of doing it sounds great too! How has this been on my page and I have just opened it! Guess it was like a belated Christmas present to me!! 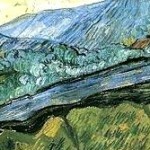 Loved this post as we so many times – especially during our fall stay at the Stone House on the Hill in Greece – talked about visiting and didn’t quite get to it. We definitely will soon! 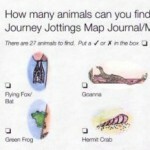 And as always, those ‘jottings’ of yours are spectacular! 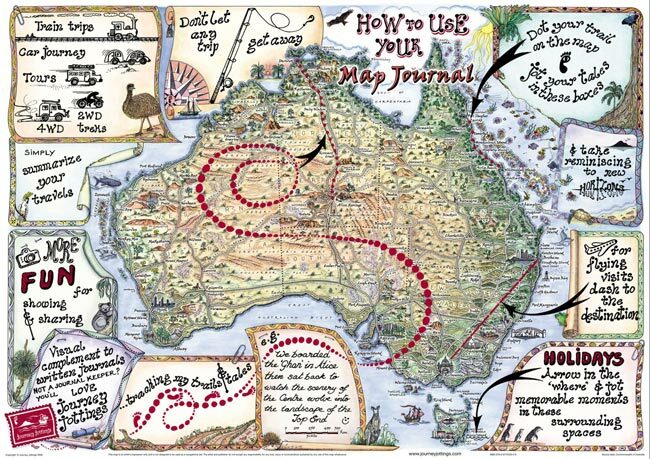 Happy New Year~ Happy Travels. How exciting to have now owned the Stone Home on the Hill for a year, and harvested your first olive crop! Wow just wow. This is one place I want to visit. Wonderful history and architecture in a unique landscape! They are amazing – Particularly when you discover they only added the stairs in the early 1900’s so the entire building structure was hauled up in baskets by rope! These monasteries are quite remarkable! 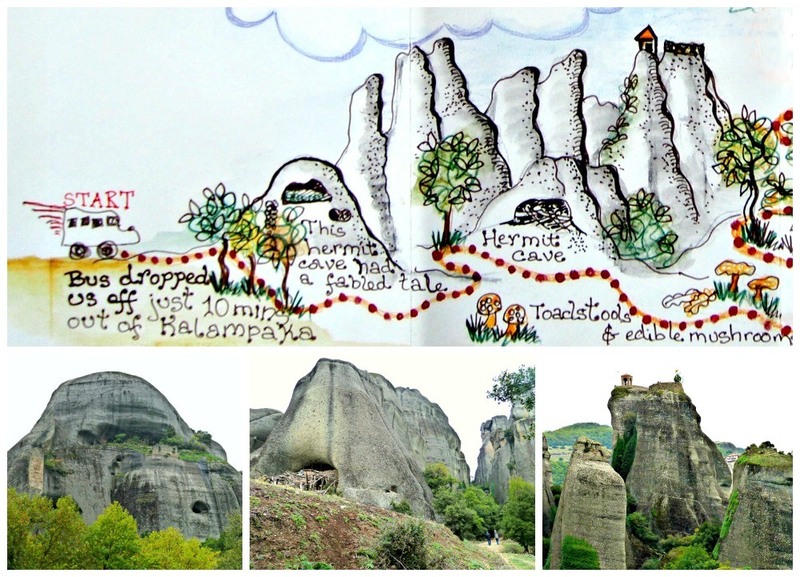 We are in Meteora right now and I was looking for some info on the walk to Ypapanti that we are planning with our kids tomorrow. I found your post very inspiring and useful. Thansk so much. Looking forward to our walk. All the best from Greece! I certainly loved this walk – And would happily do it again!